Protesters are continuing to cause mischief at the Stapleton Allotments where bailiffs are attempting to evict people from trees. MetroBus protesters who have already been removed from the site being bulldozed for a new road have pushed over the temporary fencing and mounted it in defiance. Meanwhile, one protester has locked himself to a gate with a bicycle D-lock at a second site on the other side of the M32 where a new occupation has sprung up. The new camp has also been served with an eviction notice. After more than a month making a stand against Metrobus plans by living in trees above Stapleton Allotments, protesters look set to be evicted this morning. According to a Bristol Post reporter on the scene, at least 30 bailiffs have surrounded a make-shift camp with more being dropped off by bus. The move comes two days after the council secured a second possession order for land in the area occupied by the Rising Up Group, which has said it will strongly resist any moves to get them off the land. It is not the first time there has been activity by security staff at the site, however reports from the scene suggest this is the first time bailiffs have been making obvious moves towards the camp. 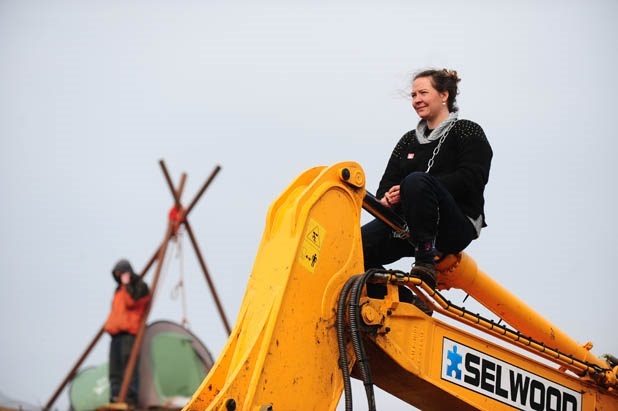 People have locked into barrels of concrete, up trees, digger diving, naked cat & mouse, locking on to digger arms, concrete blocks in caravans and more! 4.10pm. 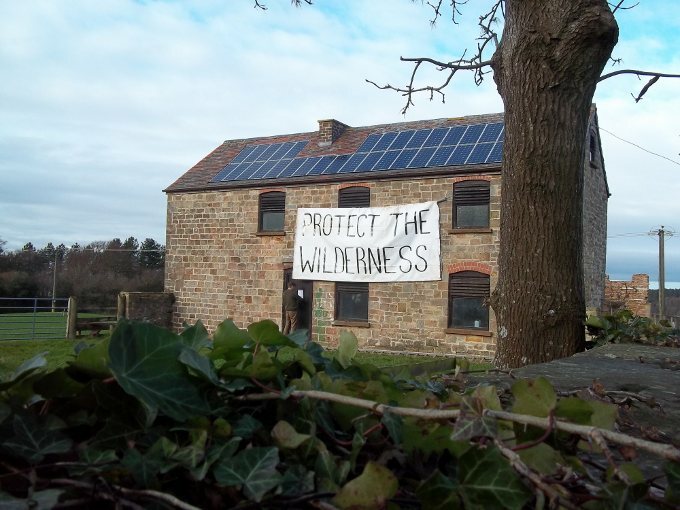 Update: The attempted eviction is still going on – all of the tree sits are still full of people who are all fine & in good spirits – giving us a show of acrobatics and dare devil climbing here & there! The heroic person in the meadow tunnel has after 7 hours been brought out – waved an arm but was on a stretcher- hopefully OK. Other people still locked onto trees on the ground and gate! They have crashed diggers and bulldozers through bird rich wooded area and have managed to swamp one of their bulldozers after digging through a culvert, which 2 people then chose to lock themselves to! .. Some security and bailiffs have been OK others heavy handed and dangerous – at one point they were about to use an axle grinder to remove a D lock from someone’s neck until we shouted that they could kill him! One woman was pulled around and one bailiff tried to drag her out of a tree – in a totally unsafe manner – all captured on video. – COME & SHOW YOUR SUPPORT & SOLIDARITY TODAY! – It is something you will never forget and a story to tell for years to come! 10.30am update Many of the protestors, including legal observers on the ground have forcibly been removed – dragged off by heavy handed bailiffs , one on one, showing completely unreasonable force, one female protestor had her top pulled up whilst a bailiff smoking a fag dropped ash in her face. A bulldozer has started illegally demolishing buildings which have asbestos roofs and a digger has gone through a bird rich woodland area razing trees – despite it being bird nesting season – making this both a worrying and illegal act. Bristol Council “Green Capital” ..hold your head in shame! The world is watching. 8.38am Update: EVICTION IN PROCESS ( ABOUT 1 HR IN) around 70 bailiffs on site – have been very heavy handed dragging off legal observers and other people – 1 on 1 ( they should be 2 people). A climbing team is there and have set up a station and medical tent. Very few police on site – most on the road. They have brought in a digger and an amphibious vehicle and set up medical area…hope not to be needed. All of the tree sits are full and some people still on the ground! COME DOWN , BRING CAMERA, BANNERS, NOISE AND GOOD VIBES! This morning about 300 peasants organized by La Via Campesina occupied the meeting of the Brazil National Biosafety Technical Commission (CTNBio), which was convening to discuss the release of three new varieties of transgenic plants in Brazil including genetically engineered eucalyptus trees. The meeting was interrupted and decisions were postponed. Earlier in the morning on Thursday, another 1,000 women of the Brazil Landless Workers’ Movement (MST) from the states of São Paulo, Rio de Janeiro and Minas Gerais occupied the operations of FuturaGene Technology Brazil Ltda, a subsidiary of Suzano timber corporation, in the municipality of Itapetininga, in São Paulo. The site occupied by women of the MST was in Itapetininga, where transgenic eucalyptus, known as H421 is being developed and tested. During the protest, the MST destroyed the seedlings of transgenic eucalyptus trees there. The action denounced the evils that a possible release of transgenic eucalyptus, which was to be voted on CTNBio today, could cause to the environment. According to Atiliana Brunetto, a member of the National MST, the historic decision of the Commission must respect the Brazilian legislation and the Biodiversity Convention to which Brazil is a signatory. Destroys Eucaliptus Seedlings The vast majority of its members are placed in favor of business interests of the large multinationals at the expense of environmental, social and public health consequences,” he says. For Brunetto all approved GMO means more pesticides in agriculture, since the packets always approved for marketing include a type of agricultural poison. “Brazil is the largest consumer of world’s pesticides since 2009. A recent survey by the University of Brasilia found that, in the most optimistic case, 30% of the food consumed by Brazilians are unsafe to eat only contamination by pesticides account” said Brunetto. In the case of eucalyptus, the application of transgenic release was made by pulp and paper company Suzano. “If approved by the committee these GE faster growing eucalyptus will mature in only 4 years, as opposed to 6-7 years presently in non-GMO eucalyptus. The water consumption will increase 25 to 30 liters / day per eucalyptus planted that it currently uses. We are again calling attention to the danger of green deserts,” said Catiane Cinelli, a member of the Rural Women’s Movement. 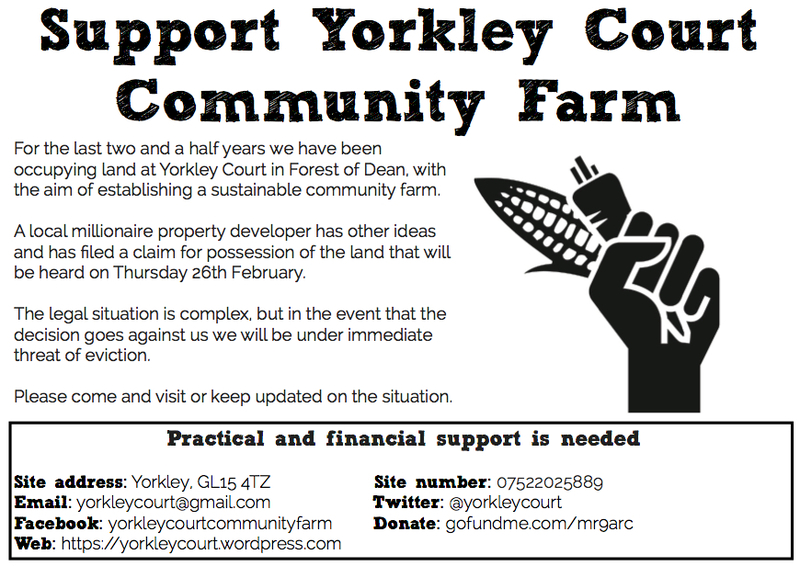 Yorkley Court Community Farm lost in court this morning. The judge ruled in favour of millionaire, Brian Bennett. There is a possession order. A timeframe for eviction has been given. 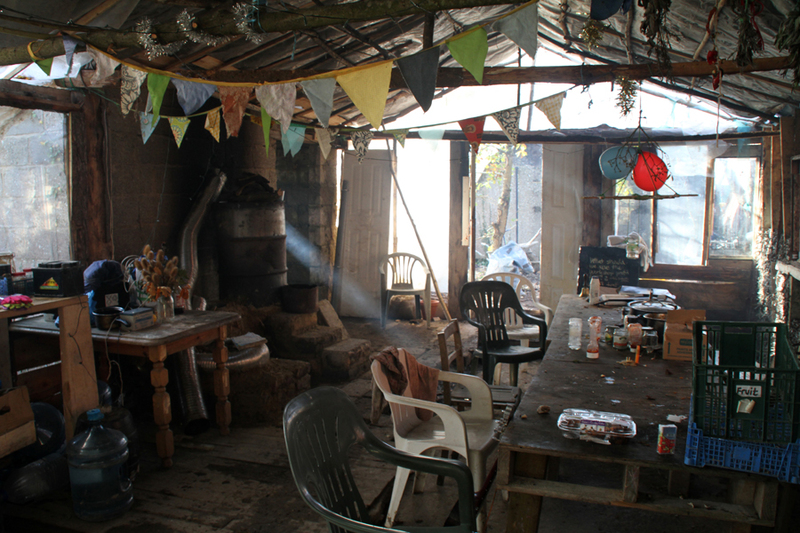 People living at the farm will be meeting this afternoon to determine what they will do next and what support they need. Please continue to support them! Visit/donate/spread the word. More people are hugely welcome on site. Travel money can be given if its a barrier for you. Please bring sleeping equipment and be prepared. When: Thursday 8 – Monday 12th of January 2015. 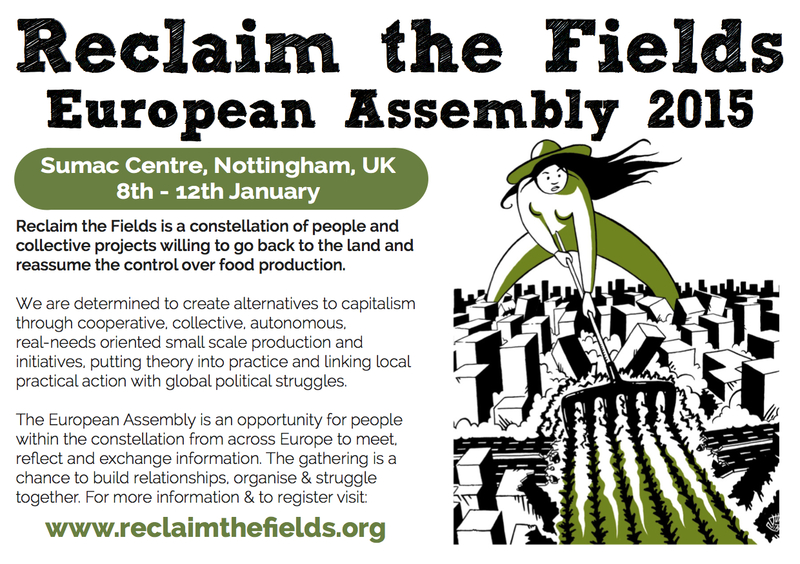 Why: The goal of this meeting above all is to meet up to see where we are at with our European Reclaim the Fields constellation and to exchange information amongst the stars and local groups. It will be an occasion to put in practice new forms of organisation which have been decided upon at the last meeting (in Austria). 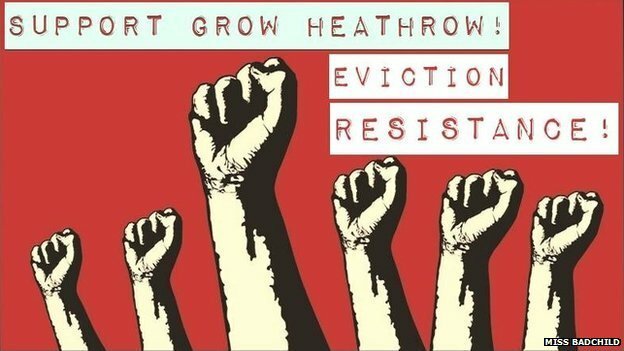 As it will take place in the UK, we also want to create stronger links with people and collectives present there and exchange on local dynamics. 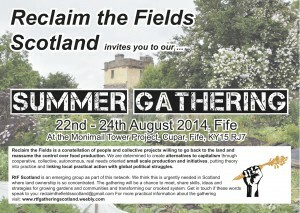 This meeting will be a working and reflection space for local/regional groups and on themes present within RTF. As such it is mainly meant for people already active in the constellation, or which are aware/informed on the dynamics and last discussions of the network. But everybody is welcome! We choose these dates (as besides our garden/farm activities might be more relaxed at this time a year) as it follows the Oxford Real Farming Conference (an alternative to an agro-business conference happening simultaneously) taking place just before the assembly in Oxford (UK) on 6th and 7th of January. The program you can find on oxfordrealfarmingconference.org. All RtF-ers are very much invited to take part (take into account there is a participation fee of about £35). 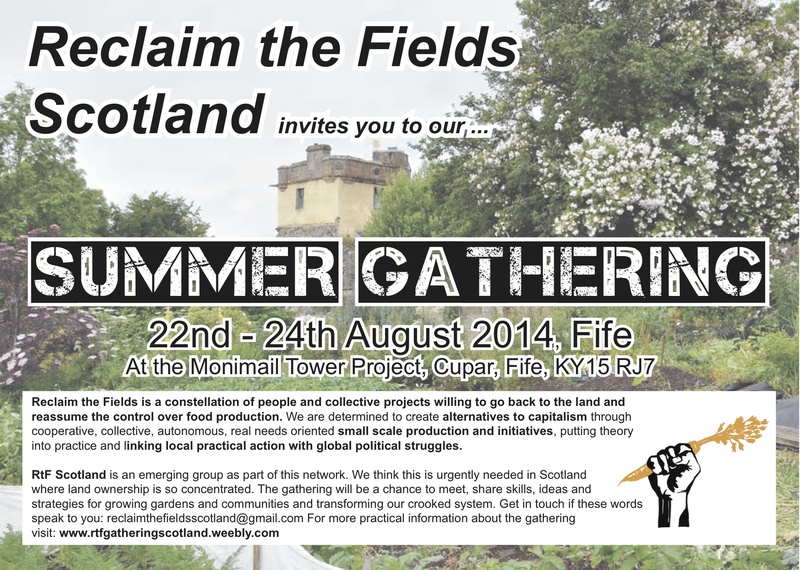 The Landworkers Alliance (UK branch of Via-Campesina) is facilitating a whole day at this conference. 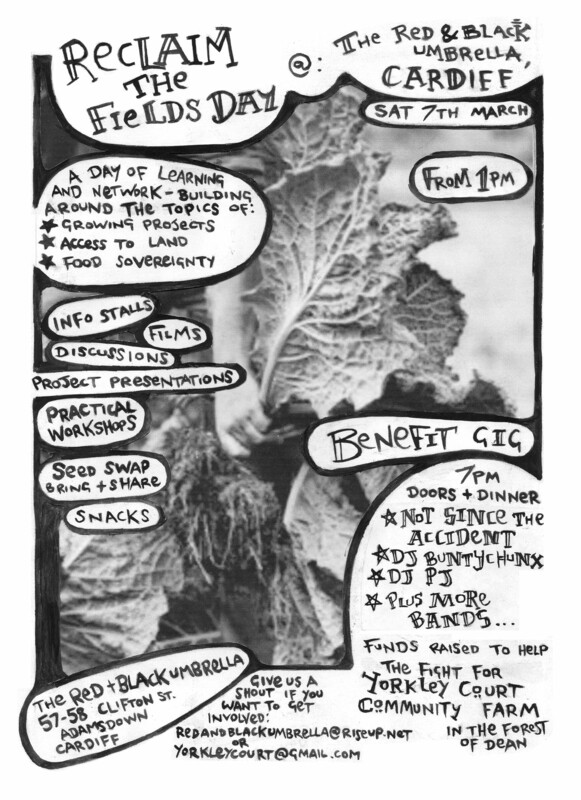 Reclaim the fields UK and Europe as well as the newly formed Groundspring network (a new entrants to farming support group made up of organic, biodynamic apprentices and others wanting to make change and get into farming) are very much invited to share their experiences on how we can procreate changes to move agriculture forward. Travel: Nottingham is right in the centre of the UK, accessible by affordable coaches and trains (from London, trains:the oxford tube and oxford express. Coach: the mega bus and national express. From oxford to Nottingham there will be a few lifts and some buses. We are applying to a fund to try to cover travel costs. So please let us know when you would come and what your possible travel expenses may be. So if the fund gets through, great; if not we will try to help each other out -so anyone who wants to come, is able to do so! Info about the host: The Sumac Centre is a volunteer-run social and community centre based in Forest Fields in Nottingham. They host multiple radical & community groups and are run on non-hierarchical principles. They have a lot of indoor space available for the assembly and indoor accommodation at both the centre and at the Housing Cooperative across the road. They run on a sliding-scale basis. We will be able to access beds/floor space/showers & warmth in the winter! Food from Veggies: Veggies, a cooking collective based in this centre will organise the cooking and local food supply. They are a vegan cooking collective supporting campaigns for humans, other animals and the environment since 1984. Even so we will help with the cooking, and any produce that people want to bring is definitely appreciated! We can connect with the multiple growing & food related radical projects in Nottingham (such as ecoworks.org.uk / summerwood.org.uk/). Registration: *Please fill in this registration form to let us know that you are coming and if you are coming by car/van this is particularly useful as then we can organise lift/car sharing as much as possible. Seeds: « Reclaim The Seeds » invite you to bring your self produced seeds and all the pedagogical material that seems relevant, in order to swap seeds and discuss about it. – DOGS: we are still checking with Sumac Centre about their dog policy. If you want to come with a dog, please contact us before at contactrtf@riseup.net, so we can talk about it. – KIDS: people with kids are welcome! We are trying to organise a special space for children at the meeting. If you plan on coming with kids, please contact us before contactrtf@riseup.net in order to talk about what you need there in order feel comfortable. – LANGUAGES: thanks to the bla collective, there will be interpretation into three or four languages depending on the needs of the people present at the meeting. Contact: If you have any questions concerning logistics or content of the meeting please contact contactrtf@riseup.net! Some background on the last European meeting and general RtF-info At the last European meeting in February 2014 in Nikitsch/Austria we worked on the functioning of the RtF-constellation. This is what came out: We still understand RtF as an organizational constellation of stars which is in constant movement and process. Stars are persons, collectives or projects who/which share the RtFs values and relate themselves and their work to the RtF goals. The stars are organized and meet in local networks which are autonomous and have their own objectives. The local networks are the base of the RtF constellation since it is essential for RtF to work from the bottom up. Apart from the local networks, there are seven working groups (website, bulletin, translation, finance, propaganda, infokiosk and a group organizing the next meeting). And five thematic groups (seeds, farm network, gender, access to land and presentation of RtF). European camps take place in summer and are bigger and take longer than the other meetings. The objective is to make RtF grow by „going to new places“, support local struggles and share skills, knowledge and ideas. h2. The last two camps took place in Rosia Montana/Romania in 2011 and in Manheim/Germany in 2013. There is the proposal to do the next camp in 2015 in Chalkidiki/Greece.